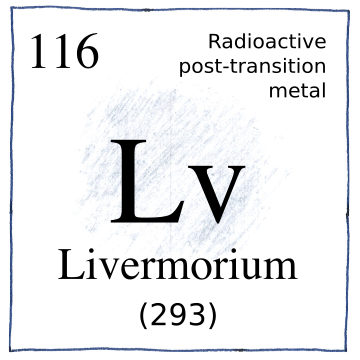 which decayed into livermorium-289 . . .
closer to the speed of light. It seems that more people were involved in the synthesis of livermorium isotopes than the number of isotopes they produced. This element got its name because the Lawrence Livermore National Laboratory, in Livermore, named after Robert Thomas Livermore, collaborated on the discovery with the Joint Institute for Nuclear Research in Dubna. Dubna wanted to name it moscovium, which name was eventually given to element 115, which scientists from Livermore also collaborated on.